Last month, while researching a post on the politics and money site, MapLight.org, I came across another interesting online resource: OpenGovernment.org. The site is still very much in beta, but after having had a chance to check it out a little bit more this weekend, I thought it worth mentioning here to our readers. The goal of OpenGovernment, supported in part by the great folks who run OpenCongress.org, is to provide and promote government transparency on the state, city and local levels. Still in its infancy, the site has launched and tracks the following states: California, Louisiana, Maryland, Texas, and Wisconsin. Given that Justia is based in the Golden State, I decided to take a look at what resources and information are available for California. Similar to the tools available at OpenCongress, OpenGovernment enables users to drill down and learn more about what’s happening in Sacramento by looking at individual bills, following specific legislators in the Senate and Assembly, or browsing by issue. 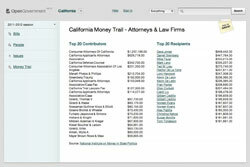 In addition, the site has its own “Money Trail” which lists publicly-available information about campaign contributions made to members of the California state legislature. As examples, check out Big Tobacco, Telecommunications and Casinos and Racetracks. You can also look up your representatives by entering a ZIP code or an address, and one hopes in the future that we’ll also see a mash up geo-tracking feature that displays bills which specifically impact where one lives, similar to the feature found on govpulse. We’ve come a long way from a parking garage in Virginia. 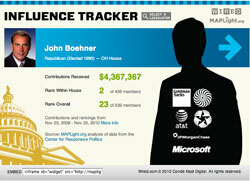 While some of our readers may already know of MapLight.org, I wanted to make special note of this terrific site that tracks the connection between money and politics, especially in light of recent reports that corporate contributions have surged to the new Republican leaders of the 112th Congress. MapLight helps citizens hold their legislators accountable by creating an easy interface to drill down and research the relationship between campaign contributions made by lobbyists and corporations to specific lawmakers on the one hand, and the votes these legislators make for or against specific bills on the other. Users can follow the money trail in a variety of ways. If you have a specific bill you’re interested in, you can search for it, or also quickly access “Bills in the News.” For instance, check out the page for the Patient Protection and Affordable Care Act where you can track the total contributions made on either side of the bill, look at “$ Near Votes” which provides total contributions given to House members within 30 days of the vote, or review charts and graphs generated by this data for some interesting visuals.